This exploration of the ways in which Visual Learning can work draws from a number of concepts: first, and most importantly, what we understand of the structure of the structure of the brain, synapses and cortical memory. The concept of plasticity, and the ways in which the brain develops and changes as a result of input, is another. The developing understanding of mirror neurons and their importance to learning also contributes to this exploration. Most importantly, it is underpinned by our understanding of learning and its developmental stages. Learning can be seen as a mental function that relies on the acquisition of knowledge (of different types and range) that is grounded in information – whether specific or perceived. What is learned is used as the basis of further learning, skills, values, belief systems, ideologies and competences. The visual learning process is one that can be seen to underpin other processes of learning (cf. Ostensiveness: Piaget, 1953). The assumptions that follow are drawn from current thinking about the relationships between what we see, what we remember and what we know. They help to explain why visual learning may be important, and how a range of technologies may contribute to these processes. Connections in the brain are constantly changing: they are not hardwired. The synapses relating to vision peak at around 10 months. The density of these synapses then declines and stabilises around 10 years of age. It is the pattern, however, rather than the number of connections that is most important. In terms of cognitive development there are ‘windows of time’ in the developing brain: critical periods for neural connections and pathways. The concept of plasticity is relevant here, in terms of the ways in which organisms adapt to environmental stimulus – in particular the brain, and the ways in which it adapts to stimuli. Plasticity refers to the ways in which brain structures can change to better cope with the environment: neurons or synapses can change their internal parameters in response to inputs and stimuli. The theory of neuroplasticity (Shaw & McEachern, 2001) describes the ways in which thinking, learning, and acting actually change both the brain’s physical structure and functional organization from top to bottom. Within the cortex, one region looks different from another, not because the function is different, but because of what it is connected to. However, all cortical regions perform a common function or algorithm. Vision is no different from hearing, which is no different from motor output. Cortical connections across the different regions of the cortex are genetically determined. What does this mean for Visual Learning? The stimuli that come from the senses of sight and hearing are not the same, although there is a similarity in the way in which the cortex processes the signals. Therefore the cortex is dividing itself into task-specific functional areas long into childhood. The importance of plasticity is that the wiring of the neurocortex can change and rewire itself. The brain regions develop specialised functions based on information flowing in during the process of development. These inputs from visual information are converted: the inputs become neural signals. These neural signals act as ‘action potentials’, or spikes, and are partly chemical and partly electrical. Each set of patterns is experienced differently, but the input to the brain is no different for visual, aural, sensual, motor signals or stimuli. Is Visual Learning more powerful? Vision relies on both spatial and temporal patterns, which are constantly changing over time, unless we simply look at unmoving object, with no change in either the lighting or our own position. The visual input is more likely, therefore, to generate a greater number of ‘action potentials’ than other stimuli, although it could be argued that music can have a similarly rich set of potentials. The processes through which memory leads to recall are based on pattern sequences and temporal or spatial patterns recreated from partial versions of pattern sequences known as invariance. These invariant forms are stored in the cortical memory and reconstructed. Predictive behaviours and abilities are based on prior behaviour and experience – for example, the progression from Concrete through to Abstract thinking (Piaget). These can be termed invariant representations. If we consider that way in which imagination works – “… seeing pictures in my head …” as one child said – then the process that we use for making predictions is reversed to produce neural inputs. In this way the visualisation process is used for performative preparation, for example, by athletes, technicians, craft workers, artists and so on. The act of visualising a routine, an action or a process enables an individual to mentally rehearse and prepare for a performance, to the extent that there is a kinaesthetic impact: visualising prepares the body for action, so to speak. Mirror neurons are a class of nerve cells in areas of the brain. They relay signals for planning movement and carrying it out. The mirror system is activated when specific actions are watched, even concentrating on a separate task (Muthukumaraswamy, 2007). Motor systems in the brain are activated when a person observes an action being performed: it suggests that we understand and learn to imitate the actions of others through these brain mechanisms. Mirror neurons therefore reveal how children learn. Mirror neurons fire in response to chains of actions linked to intentions. They then provide a template for the individual to replicate, a model for analysis of others and for prediction. Mirror neurons provide clues to how children learn: they are active from birth (Meltzoff, 2007). This suggests that human children are ‘hard-wired’ to learn through imitation, with their mirror neurons involved in observing, and then practicing. Earlier studies – the theory of Observational Learning (Bandura, 1986) suggest that an observer’s behaviour changes after viewing the behaviour of a model. Findings from research into mirror neurons provides additional support for the Observational Learning hypothesis, which was often typified as simply constructed from causal connections. In fact, observation directly improves muscle performance via mirror neurons. By watching a game, a performer will be better able to predict what will happen next. It may well be that the Nintendo wii captures and extends this process. For the past ten years the term ’interactive whiteboard’ has produced discussion and dissent, with a significant group of educationalists and researchers expressing concern that the technology did not, in fact, appear to lead to a shift in pedagogy on the part of users – and that the technology seemed to reinforce traditional modes of pedagogy, rather than those considered ‘interactive’ (Moss et al, 2007). It may be helpful, however, to reconsider the notion of interactivity in the context of technology use, and see it in terms of the interaction between the visual objects and the ways in which these are processed. Changes in input, the ways in which mirror neurons process the inputs and the impact on memory and imagination, may be more significant than the preferred pedagogical approach of a teacher. Indeed, consideration should be given to the ways in which the physical configuration of the learning environments – ambient lighting, the effects of various colour combinations, and so on – and the impact that these have on individuals. Vision relies on both spatial and temporal patterns. These patterns are constantly changing over time. This visual input therefore generates a greater number of ‘action potentials’ than other stimuli (e.g., aural). The use of visual display technologies provides an easy focus for learners. 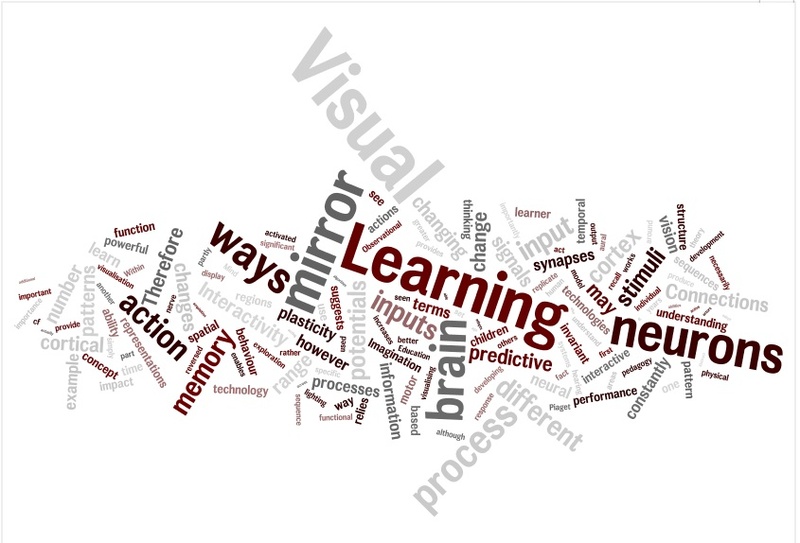 By the visual sequencing a learning process mirror neurons can be fired and the sequence then replicated, modelled and applied to other contexts – a powerful reinforcement in mathematics education, for example. This works in two main ways: first, digital representations can be replayed until the learner can see the range of models and their possible permutations; second, the mirror neuron effect enables the learner to replicate and reproduce them to demonstrate understanding amd application. When we talk about interactivity (as, for example, with interactive whiteboards), the concept of interactivity should not necessarily be predicated solely in terms of the human actors. It is much more between the learner and the display – and the ways in which there are constantly changing visual inputs, and therefore more ‘action potentials’. These changes in input produce increases in the range of visual memory, predictive ability and in the visualisation process, with mirror neurons an integral part of the process.. It should be stressed, however, that there are innate differences in perception: whilst a number of observers witness the same events, neither the ‘action potentials’ or the outcomes are necessarily identical. You can view a summary presentation here. Piaget, J. (1953), The Origin of Intelligence in the Child, London, Routledge and Kegan Paul. Greenfield, S. (2003) Tomorrow’s People. London. Allen Lane. Maturana, H. R., Varela, F. J. (1980) Autopoiesis and Cognition. Dordrecht, Holland: D. Reidel. Mountcastle, V. (1978) An Organising Principle for Cerebral Function: The unit module and the distributed system. In Edelman, G. M., & Mountcastle, V. B. (1979). The Mindful Brain (pp. 17-49). Cambridge, Massachusetts: MIT Press. Muthukumaraswamy, S.D., Johnson, B.W., Gaetz, W.C., Cheyne, D.O. (2006). Neural Processing of Observed Oro-Facial Movements Reflects Multiple Action Encoding Strategies in the Human Brain. Cognitive Brain Research, 1071, 105-112. Muthukumaraswamy, SD., Singh, KD., (2007). MEG evidence for automatic engagement of mirror system areas. Society for Neuroscience, San Diego, November, 2007. Meltzoff, A. N., & Brooks, R. (2007). Intersubjectivity before language: Three windows on preverbal sharing. In S. Bråten (Ed. ), On being moved: From mirror neurons to empathy (pp. 149-174). Philadelphia, PA: John Benjamins.